Back in September, a new series came into my life and completely stole my nerdy heart. I binged the entire first season of The Dragon Prince in one night a few days after its release and fell head-over-heels in love with the characters, the world, the design and the story. Rayla became my favorite character the moment she opened her mouth and started sassing people with her Scottish accent and I knew that I absolutely had to cosplay this snarky elf. I was finishing up my last semester of undergrad at the time and didn’t have time to spend on cosplay, but I used what spare time I had to draft patterns and make mockups. As soon as I graduated, I threw myself into the build. From Christmas to the day we left for Katsucon, I was either holed up in my workroom or at the fabric store. The armor pieces and boots are all made from clothing-grade pleather, which is surprisingly hard to find in the right colors. I bought my wig two weeks before Katsu and had it express shipped. My anxiety was high about it arriving in time when we had two massive blizzards in my hometown the week it was set to arrive, but despite almost a week long layover at the UPS Store, it made it in the nick of time. 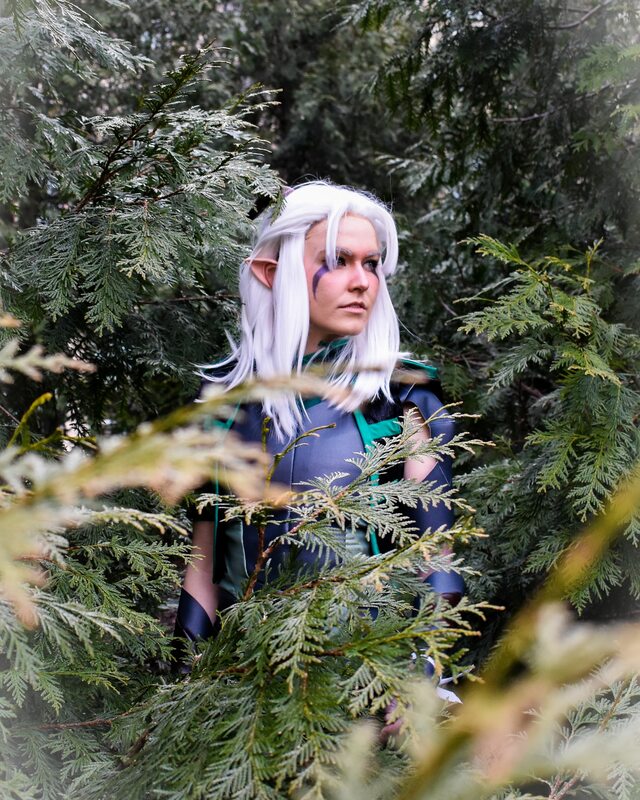 With the help of my wig-savvy bff, we got the wig styled and cut and Rayla made her debut on Friday of Katsucon 2019. I wound up wearing her almost all weekend and she has since become my favorite cosplay.